Interests - Loves shoes and handbags, her other favourites are pens, note pads all shapes and sizes, stationery, making cards/craft pictures, Swimming, Horse Riding, Music on her ipod, listening to stories, camping in our VW Campervan and day trips in the VW Beetle. 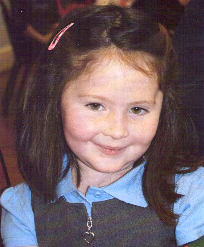 In March 2005 Summer was admitted to A&E for tests. She was not walking, had projectile sickness and we were concerned about her vision. An MRI scan showed a brain tumour (benign and slow growing). Summer’s ventricles were blocked and she had Hydrocephalus. She was transferred to Alder Hey Children’s Hospital, Liverpool. After an 8 hour operation, Summer had pulled through and was in intensive care, but we were informed that Summer was now blind. In August 2005 the MRI scan showed re-growth, so Summer had a central line inserted and started Intense Chemotherapy for four months. At Christmas, Summer’s scan showed the tumour was stable, we can’t explain the relief. Summer is still currently on chemotherapy until February 2007. Her recent scan has showed a slight shrinkage in her tumour which we are overjoyed about. Summer has adjusted to what bit of vision she has in her right eye and uses it well to navigate familiar surroundings. She is a little miracle. We are so proud of her; she is a very happy little girl and makes everyone who knows her smile. Summer’s next scan is in June. She is still not out of the woods as she still has residual tumour remaining in the optic nerve area and we could still face relapse at any time in the future, but are really grateful that we have the time in between to enjoy, and her prognosis for the future is getting more positive too. We decided to continue with the daily growth hormone as Summer has grown 3cm in the last 4 months and without it affecting the tumour growth. We are extremely relieved and hope to give her the benefits it will bring. Summer has other outpatient appointments this month and next and we are back at hospital in May to see her other consultants about her growth levels. Thank you to everyone who has sent positives thoughts and wishes, it really does work. We send our thoughts to the other Post Pal families too. Thank you for the lovely memory parcels for Summer and Phoenix, the note pads, letters, cards and pictures. Our children are very grateful. Post Pals is a truly wonderful and hardworking charity. We are very privileged to be a part of Post Pals and continuing to spread the smiles. Santa was very kind to us all but sadly Summer got a sickness bug on Christmas Eve and was poorly through the night and then it was passed onto all of us over the Christmas period, but thankfully we all feel much better now. We would like to thank EVERYONE who sent the children Christmas cards and gifts and to the assigned reindeers and elves, our children are extremely lucky and love all their post. Summer has her MRI Scan on the 12th Jan so we have everything crossed for stable news. Sadly this time we do have to wait longer than usual for the results (which are the 25th January) but we have booked some pantomimes and other activities in between to keep us all occupied. All being well, if there is no change, Summer will continue on her growth injection despite it not being pleasant, but she is coping really well with it and we all wish for the benefits it will bring. Thank you for everyone’s support and smiles that they bring into our lives and a massive thank you to Hayley who was Summer’s assigned Pal last year, we will continue to stay in touch. Thank you to everyone from all around the world for their cards and thank you to Jenny and Pippa for writing to Summer in Moon, it was very thoughtful. Thank you to the Elves for sending the children amazing parcels and gifts, it was extremely kind and thoughtful. Apologies for missing our September update but we are having building works done. Hopefully all will finish soon and we can get back to normal though. Summer is doing well at school and has started learning Braille again which she is enjoying. She has been taking her daily growth injection too and being extremely brave. The children went to watch Disney on Ice in Manchester and loved it. Summer’s next scan is 12th January so we are going to enjoy Christmas and see what the New Year brings. Thanks to everyone who sends post and parcels. Apologies if we have not had chance to reply but we are very grateful and it really does make the children smile. Many thanks to Post Pals for the Halloween goody bags – the children were delighted! Thank you to everyone who takes the time to write and the thought that goes into the parcels is overwhelming. I have mixed news. The great news is that Summer’s tumours remain stable with no new progression at present – we had a long chat with the consultants regarding Summer’s prognosis and future treatment – he stated that the lesions near her brain stem that showed growth in January are new and not from the original diagnosis in 2005 which is the optic nerve and hypothalamus region, so they will continue to monitor her closely and re-scan on 12th January. He also said that with this type of tumour he would expect relapse within the first 3 years of having chemotherapy but it has been known for some patients to relapse within 3-6 years of treatment. He also confirmed that chemotherapy works for 35% of patients to keep them in remission, but sadly we know this isn’t the case for Summer. Just to add to our worries, they are still insisting that growth hormone is not linked to tumour progression and the importance this treatment is to Summer’s future health. We have until January to give our decision if not sooner. There is no right answer or easy solutions without high risks – it is like a rollercoaster ride you can never get off. On saying that, we do have so many positives and that is seeing Summer waking up every day with a big smile asking what’s happening today!! To Post Pals and all your support who deliver smiles on a daily basis, you really are all tremendous and we are extremely grateful – I know the children love Post Pals, so thank you!! With thanks this month to:- Benedicte, Mandi, Hayley, Sam King, Viks, Sheelagh Hawkins, Katie, Nikki, Jade Sherwood, 2nd Chirk Brownies, Teresa. Apologies if I have missed anyone. The children have had a lovely month of post. Thank you to all the Team – especially for their unique pillow cases as it really is a wonderful keepsake. Also, many thanks for the Alton Towers Tickets. We all had a wonderful day out and Summer was so delighted riding a car with the Peugeot Driving School with the help of the staff steering the car for her. The highlight of the day was having her own driving license, bless her. Thanks to Josh Turner for the lovely card and badger as it’s so cute, to Sarah G for the postcard, Ella, Theo, Poppy and Imogen for their pictures and cards, Sam King for the princess pencils and rubbers, Hayley Rose for the Summer Theme Parcel which is so very kind, Karen for the card making items, Mandi for the Camper t-shirt, yellow campervan, stationery and little horse and letter, Jodi for the Bob the Builder colouring set for Phoenix, Kate for the Campervan picture and postcard. Our children are very lucky. Summer has her scan next Friday so we are thinking lots of positive thoughts and will update when we have news. We would like to send our thoughts and wishes to all the Post Pals families and let them know that we are thinking of them. Summer had a hospital appointment this month and she has a sticker chart for when she eats new fruit and vegetables. With her not being on the growth hormone injections at the moment, we have to be careful what Summer eats to maintain a healthy lifestyle for her. She is doing really well and trying very hard. Summer also has her next MRI scan on the 27th August. The children have had another lovely month of post thanks to everyone at Post Pals! Phoenix had a lovely birthday with a few friends in the garden on his bouncy castle and would like to thank everyone for his cards. Summer has been over the moon with her post this month and is delighted at all the notebooks and pens that she has received. Thank You. We will try and respond to all who leave an email or address. We have a new addition to our house called Eric the tortoise (that was his name already so we thought it was only fair to keep it)! The children love him and he’s also very tactile for Summer to feel. Even Star (our rabbit who is nearly eight) has accepted him into her garden too which is lovely. It is nearly the end of another school year and I cannot believe Summer will be gong into the Juniors – it has gone so quickly. We are going to a VW Show this weekend with the children so are hoping for some sunshine. Thanks to:- Halfcost/Post Pals for the dressing gown, paint your own plant pots, the cars for Phoenix, handbag/shoes pencil case, mp3 pillow stereo, light up flower. To Jodie for the Kitty pens, Hayley for the fame pencil case and miss chatterbox soft toy, Steph for the notebook, Grace/Jill for the notebook, Sarah for the notebooks, Jess for the card, Teresa for the notebook, and Sheryl for the notebook. We would also like to thank Hayley for the very kind parcel for Father’s Day. Apologies if we have forgotten anyone but thanks so much. Summer has been doing really well at school and has earned a certificate and medal from her specialist teacher for effort. We had a busy half term taking Summer and her siblings to Woburn Zoo safari park which was brilliant and we would highly recommend. There is also a walking safari so Summer could walk really near the wallabies and baby monkeys, and she went on a swan boat with daddy too. We then went camping near the coast in our campervan and were very lucky with the weather as we had bbq’s and spent quality time playing outside. Summer still goes horse riding each week and really looks forward to it. There is a new horse that Summer has ridden called Pebbles and last week she was on Toppy. This Friday she is starting private swimming lessons. She goes every week with school but as she likes it we want her to have more opportunities on a 1:1 basis. Next week we look forward to seeing Summer’s sports day and the end of year assembly. Summer has got a hospital appointment at the end of the month but her next MRI Scan is not until the end of August so we appreciate the time we have to enjoy together. We are so grateful to everyone who takes the time to write and send gifts; hopefully we will try and reply. We have so much thought and kindness being sent through the post and it’s nice for me to read other people’s interests and hobbies to Summer – she says she feels lucky to receive her post. We’ve received a CD, craft, teddy, bags, stickers, balloons – everything our children could wish for and more! It’s very kind! Hope we don’t miss anyone out but THANKS to… Bethan, Amber, Hayley-Rose, Sarah G, Iona, Natalie, Samantha, Jazz, Nicola, Caroline, Sam King, Leonie, Despina, Paul, Stef, Baby Keera, Polly F, Sophie, Stephanie, Dominic, Karen & Family, M.Thacker, Laura, Billie, Becky & Sohpie, Castercliff Primary (Lucy, Shone, Kayleigh & Kiera), Melissa Basquil and more! We are so grateful and thankful that Summer’s results were so amazing – it has given us another 4 months until the next scan the end of August. We just need to make the decision of starting the daily injections again which is a very difficult decision but I know we will do the right thing for Summer. Summer and Phoenix have had a fabulous amount of post thanks to Post Pals and Russel Howard – I am so pleased that Post Pals is getting the recognition it deserves and that people are finding out about the great work that the Post Pals Team do! The children’s smiles are priceless; they get so excited when they receive their post – thank you!! I hope we don’t miss anyone out but thanks go to:- Hayley- Rose, Sarah G, Lesley, Steph, Francesca and Scarlett, Libby, Cavelle, Emily & Mummy, Sean, Matthew Kenyon, Liz, Stephanie & Baby Lucas, Heather & David, Maria& Michael, Kate Dee, Margaret Nagy, Suzie & Taylor, Willow, Horndale County Infant School, Helen Clark, Lucy N and emails from Suzi Mooer, Nicola Presavage, Bronn Broker, Rachel Samuels, Lesley & Tyler, Victoria Moloney, Nicole Finlay, Ally Seddon, Jessica Chapman, Andy Gibb. We went to Clinic today for Summer’s results and feel like a miracle has happened… her tumour has had shrinkage and is smaller than the growth in January. There is no real explanation and I cannot describe our happiness and relief to have such a weight lifted for the time being! Summer is still under close observation and will require another MRI scan in 4 months time – we do have a tough decision to make in starting the daily growth hormone injections again which is just as important to her health and keeping the tumours stable. We cannot thank Post Pals enough for their tremendous support and messages that have been sent in the past couple of weeks. Whilst we feel we can breathe a little easier now and have a little celebration, we also wish to send prayers and positive thoughts to the families who need it at the present time. The children both received some lovely post last month, thank you so much to everyone who sends mail, it is extremely appreciated. Summer had a wonderful birthday, it was very special and even more so to have shared Mother’s Day on the same day! The animal party went down a treat, it was a great tactile idea for Summer and her friends enjoyed it too. Summer also had two visits from the tooth fairy in one week so she was very pleased. Summer has had some hospital appointments over the last month but everything is on hold until we have the scan which is less than 2 weeks now. The nerves are setting in but we are being brave and strong for Summer as she is so aware of everything now she is older and we don’t wish to tell her too much, but don’t want her not to be prepared either! So thanks for everyone’s continued support. We will not know the results until the 27th April so will be able to share this with you then. We had a week away over Easter and stayed in a little English cottage and had days out. It was fantastic quality time with the children despite the rainy weather and once we arrived home the Easter Bunny paid a visit. Hope you had a lovely Easter too. Thank you to everyone who takes the time to send our children smiles and I would like to say a special thank you to Hayley for thinking of me on Mother’s Day and for my gift – it was such a wonderful surprise. Thank you to everyone at Post Pals and for welcoming Summer’s return. Summer and Phoenix have had a great Postie Month, it really has made them smile and excited. Summer has got hospital appointments this month and her birthday which she is very excited about. We have booked her an animal party so she can feel and hold them if she wants too. April is a big month for us as she has her MRI Scan which will determine whether she goes on chemotherapy treatment again every week for two years. So we have everything crossed for her. We would like to thank everyone who sent Summer and Phoenix post this month – Emily Holden-Storey for the beautiful gifts, Laura and Jamie for the photo and lovely letter, P – card, Rosie – card, Sarah G lots of cards, Williams S Valentines Elephant, RKEM Designs for the beautiful hand made bag and purse, Niamh W beautiful gifts, Hayley-Rose cards and Audio CDs. Our children are very grateful, thank you. Apologies if we have left anyone out. Summer left Post Pals for a while as she was doing really well. Unfortunately, scans in January 2010 have shown new tumour growth, so she has re-joined. As she is currently well in herself, her parents are going to wait until the next scan in April before deciding what to do. They then might have to start second line weekly chemotherapy for another 2 years or radiotherapy. We are delighted to inform you that Summer’s scan results remain stable and there is no new progression, which means we have 6 months of breathing space until her next scan (which is a week before I am due to give birth!). They said it is priority now for her to start growth hormone injections, as it was first noticed nearly a year ago, so she will hopefully commence them after the next scan if that remains stable. The day of the scan was quite traumatic for Summer. She had the magic cream put on which she was fine with, but when they tried the cannulas they wouldn’t go in as her veins had collapsed, so she had to have gas. They then told us that her Consultant was away until the following week so it was the longest weekend we had had in a very long time. Thankfully it was a positive result which we are truly happy about but cannot begin to describe the anxiety of waiting and not knowing. Summer has started doing swimming at the Blind school that she attends twice a week and she is enjoying it. She is getting confident with her moon too and is now spelling words and can read moon letters. We are so proud of her progress, she is working very hard. We have made a decision in that we feel extremely lucky that Summer has been treatment free for nearly two years and feel that it is time for Summer to move on from Post Pals so that it gives a chance for other children in need to receive the wonderful support and smiles that you can give on a daily basis. I cannot begin to explain the happiness and positive thoughts that Post Pals has had in our lives over the past few years and it has certainly helped Summer to keep on fighting through her journey and keep her smiling every day. Summer wants to be a postman when she grows up like her daddy so she can deliver some cards to children who need a smile. We will still regularly check on the other Pals and send post though and keep you updated on Summer’s progress. We would also like to send a cheque to Post Pals to show our appreciation and to keep the smiles going. Summer is remaining well apart from a lump on her right eye lid. It is looking like she will need an operation to remove it as it is getting larger, so we are going to be moving forward her eye appointment. Summer has also recently started a dual placement where she attends mainstream school 3 days a week and a Visually Impaired school 2 days a week and it’s working out well. We are so proud of how Summer has settled and she is working so hard. She is now reading words in moon which is a type of braille and she is so happy about it. Summer is delighted to be a Christmas Elf again this year and I think if she could she would love to buy everyone a gift! Thanks to everyone at Post Pals who continues to send post to all the Pals, including Summer, it really is an amazing charity and well done to Viks for her award, it’s so deserved! Summer had such a wonderful posty month and from people in America too! Summer has had quite a well month apart from that very nasty sickness bug that everyone had. We enjoyed a few days away at school half term with friends in Abersoch and the children loved the freedom of being outdoors despite the freezing weather. We also took a trip to Gloucester to collect Summer’s new red trike and she was so so excited it was wonderful – so we have wrapped up warm and been on a few short bike rides. Summer has got an eye appointment in December so we will be able to find out if there are any changes. Summer would like to thank everyone who kindly sent her cards (including handmade ones), letters, and craft presents. Thanks to Erin and Kyle for the dolly and pony, Kate for the amazing craft box, Laura for the cuddly squirrel, Maria and Michael for the Halloween card, Maddie for the Summer card, Margaret in America for the Smile Card, Helen for the fabulous Campervan Card, Jane for the Disney CD, Garce for the pencil holder maker and jewel box set, and so many more, apologies if we haven’t mentioned everyone but Summer is so grateful and feels so lucky to receive post! Summer has been busy having lots of days out on picnics, feeding animals, quad bike riding, collecting shells on the beach, lots of craft activities, horse-riding, and it has been great fun. Summer had her MRI Scan this week and despite her appearing extremely well and healthy with no symptoms; the scan has revealed a new mass next to her brain stem. The Oncologist cannot confirm whether this is tumour or not but there has been growth since the last scan. It is too risky to biopsy, so the plan for now is to observe until her next scan in January. If there is more change then Summer will need to start weekly chemotherapy again for two years! As you can imagine we are pretty gutted but have decided to have as much fun and experiences between now and January just in case our journey takes a different path. Summer has received some beautiful cards and gifts this month, all very thoughtful. We really appreciate the time and thought that goes into making these beautiful cards, thank You! Thanks for everyone’s continued support it are very much appreciated. We have been enjoying the start of the Summer Holidays – in fact the time is going very fast. We had a few days in Stratford last week and took Summer and her baby brother to the Cadbury’s Factory. We had a great time tasting chocolate and the tour was great. We then went to Abersoch for a few days and stayed with friends – Summer and her daddy went quad biking! I couldn’t believe how brave Summer was – she was having the time of her life! Summer didn’t enjoy swimming lessons and she said ‘please don’t take me back’. To be fair, it must be frightening with little vision, so we have decided to wait until Summer feels more confident in the water. She loves her horse riding lessons and this week is going on a special Horse Riding Picnic at a different Riding School – she is very excited! Summer’s scan is in two weeks and she is getting a bit anxious now and asking questions. She also has to have two teeth taken out while she is under anaesthetic, so your thoughts will be appreciated on that day. In the meantime, we plan on sharing lots of experiences with Summer and her little brother before she goes back to school. Thank you to everyone who sends Summer post and follows her journey – apologies for not making the Post Pals party but hopefully we can attend in the future. Summer has had yet another lovely month of post, thank you to everyone from Post Pals! Thank you to everyone who thinks of little Summer and ALL the brave children! Summer has started horse riding and absolutely loves it. We were not too sure whether she would like it or not but want her to have as many experiences as possible. She is going again tonight and the horse that Summer has been riding is called Libby. This weekend Summer is going to start swimming lessons. She is confident now about going into the water, whereas before she couldn’t go because of all her chemotherapy treatment and central line. We will let you know how it goes. We have been back to the hospital and have been told that Summer will require daily injections for many years but we have time to make our decision. Summer’s next MRI scan is in August! We have everything crossed for that. We have had a brilliant time – in the half term holidays we picked an activity or an outing out of a hat so everyday we had something nice and fun to. We went on a walkabout picnic, swimming, did craft activities and Summer actually let us paint her hand so we could have her and Phoenix’s handprints, yay! We had a great day out with National Children’s Blind Society and Summer loved it, she got to play on the drums and electric guitar, meet people similar to herself, jump in the ball pond, pick some eggs the hens had laid – it truly was a fantastic experience for all of us! This weekend we are away again in our VW Campervan to a show – weather is looking good. Plus baby Phoenix will be 1 this weekend so Summer is very excited for him. Appointment wise, this month we will meet with Summer’s Endocrine doctor to discuss treatment plans and also the Dentistry Dept have sent their referral through so we have a few things to be going on with. Summer has received some lovely cards this month – she said “I cannot believe how nice people can be to send cards and pictures to me!” Special thanks to the Post Pals Team and Laura H for the wonderful craft set and fluffy bag! To Jim for her wonderful smell card, it was very impressive and thoughtful. To Kate W again for a beautiful card, Shirlayne, Elidh, Emilia and Aine for their wonderful hand crafted Braille card and Hayley Thorn for her beautiful handcrafted postcards. We hope we haven’t missed anyone out. Thank you all so much! We got some news this afternoon regarding Summer’s blood results. Unfortunately they are not what we wanted to hear – she is going to need growth hormone injections daily. So we’re really gutted for Summer as she has been through so much in her little young life. We are all doing fine. Summer and Phoenix have had a wonderful month of post and parcels thank you all at Post Pals. Summer was in hospital last Friday to have hormone level tests and ultrasounds – she was beyond brave – she was starved from Thursday at midnight and couldn’t eat until Friday lunch time. Over the course of 4 hours she had 9 blood tests and she wouldn’t eat and drink after the tests so when she went to ultrasound she didn’t have enough fluid inside, so after another hour we went back and they were able to do the scan. We are awaiting the results now to see if she needs growth hormone or any other medication. Summer has also got the dentist next week. She needs to be referred to the hospital to have her tooth taken out as she has had an abscess and due to the chemo and diet on treatment, her teeth are now very weak. So we will keep you posted on news. Special thanks to Shirlayne and family for cards, jokes and the fabulous card making set. To Post Pals for the Louis Vuitton bag! Grace for the hair accessories, she loves them! Also to Lynn for the beautiful fairy doll. Thanks to Jenn, Helen F and Seren S too. Thank you all for putting a smile on Summer’s face, it makes more of a difference than people realise. She was especially happy when she knew her brother had received mail too so thank you! We are so grateful and overwhelmed that so many people take the time to think of our precious children and to put smiles on their faces everyday . We would like to thank everyone at Post Pals! Summer received a lot of mail this month and she was so excited everyday. March was a very eventful month for us. It started with Summer’s 5th birthday, where she received a staggering 60 birthday cards and all the princess goodies that you can buy! She was extremely happy to receive some sweets through the post, a reiki teddy, handbag, hair accessories, cd’s, stickers, everything that she could have wanted and much more. Summer then went on to have her MRI scan, which she was very worried about going for, but again amazed us with her bravery! We are delighted to say that her tumour remains stable after a year off chemo, but she does require further endocrine tests, which she is going for this month. She is having her hormone levels checked and an ultrasound. Then it was Easter! Again, thanks everyone for their lovely Easter cards. I don’t think Summer could believe she had much more post than mummy and daddy and she shared it with her baby brother! We did a treasure hunt which she loves. The end of the month we had a week up in Scotland, it’s so relaxing we could have stayed there! The children loved the freedom and enjoyed making some new special friends. We had days out to an animal farm, a castle, crafts, it was brilliant. Now it’s back to school! Summer has had a fantastic month with Post Pals, thanks to all who have sent Summer cards and presents, even Valentine’s cards from abroad!! Summer has had a mixed month complaining of head aches and falling over far too regularly, bless her. She is doing brilliantly at school and her progress is great. She has learnt to type S in Braille and can spell her name verbally. She has been very socially active – swimming, days out, picnics, playing with friends, the cinema, and lots of birthday parties! Summer is going to be 5 on the 14th March – what a celebration for us all! It is 3 years since Summer’s diagnosis. Her scan is on the 17th March and we have to wait 8 excruciating days for the results, but as soon as we know we can let you know. compared to her weight and age, so we will be meeting with the Endocrine team to discuss if Summer requires any intervention yet, but hopefully not . We are going to Scotland for a week at Easter and really looking forward to the sea air and quality time with Summer and Phoenix. Apologies for it being late, but I would like to thank everyone who sent Summer parcels and cards at Christmas! Summer is still doing really well. She has settled into school and is very popular, especially with her being pretty small as everyone wants to look after her. This is nice but Summer is very independent and likes to feel that she can manage on her own, which is understandable. We went to Euro Disney for 4 days last week and had a magical time. Summer was so happy to meet all the Princesses (her favourite being Cinderella) and Phoenix loved all the characters. It was an experience we can treasure forever! Summer is going to the dentist this week for 2 fillings which is pretty bad at her age, but I think the chemotherapy has had an impact on her teeth. I will let you know how that goes! Summer is 5 in about 6 weeks which is an absolute miracle for us especially, after her diagnosis at 2, so an extra celebration for us. Two days after her birthday, Summer has her next MRI scan to determine if there has been any further tumour growth. She will have been off chemo for nearly a year by then. So fingers crossed. Summer has started learning Braille in reception class now and seems to be enjoying it. She can spell her name but cannot write it yet. We are so proud of her! Thanks again to Post Pals for their continued support, it really helps! Summer has caught a cough and cold from school and it has wiped her out, bless her. We had two hospital appointments last month, one with our local Paeditrician to see how Summer’s growth and weight is. After all the chemo she has had we are waiting and observing at the moment, but next March we might have to intervene with growth hormones if Summer doesn’t start growing soon. Hopefully all will be ok. We also saw the Eye Specialist who was over the moon with Summer, he said she was very co-operative and a little angel. He also said her vision has not improved, it’s her ability and confidence that has, we are so proud of her! Our next MRI Scan is on the 17th March just after her 5th birthday (which will be another personal and double celebration for us all). We are all very excited about Christmas. It is extra special for us this year as it will be the first Christmas we will be at home as Summer isn’t on treatment at the moment. It will also be Phoenix’s first Christmas too. We are very fortunate enough to be going to Lapland next Tuesday, we haven’t told Summer yet so it is a bigger surprise. We would once again like to thank everyone including Post Pals for all their support and parcels and cards that Summer has received this year. We are eternally grateful and are so happy to be able to be an Elf this year and make someone else happy. Summer has had a brilliant month receiving post it’s been lovely for her. We also have some really great news! Summer’s scan results were positive; there has been no tumour growth since the chemo completed in April, so 6 months off treatment now. Summer’s scan day was very traumatic for her, they put magic cream on both hands and tried 4 needles in one hand and two needles in another before deciding that she would have to be put to sleep with gas as her veins have collapsed and they couldn’t put a cannula in. It was so upsetting for her and for us, when she woke up from her scan she was hysterical as she thought something was still happening to her so it took us an hour to calm and reassure her that she was ok.
We can now celebrate our first Christmas in three years with Summer well and we cannot wait. We all had a fantastic time in Scotland, Summer held a giant cockroach! She touched lots of animals, we visited a farm, a transport museum and even saw an Old VW Campervan just like ours!! We also went to a science museum which was very busy because of school holidays, but it was very tactile and sensory and was a great day out for us all! At night we would walk along the beach and enjoy the sea air and Summer made lots of new friends. In the half term holiday we took Summer to visit Thomas the Tank Engine Tour which was at Llagollen Railway and she thoroughly enjoyed it. We also went swimming, Summer was so brave she went into the water with the arm bands and enjoyed splashing her legs while we held onto her. She has been a very busy little girl. She is very tired this week as she has got a bad cough and a high temperature but nothing we cannot fix without lots of cuddles and kisses as she has lots of birthday parties to attend to; she has a better social life than mummy and daddy!! Thanks to everyone at Post Pals who has sent Summer post, we really are very lucky. Summer has started school and is really enjoying herself and making new friends. Phoenix is nearly 4 months – time is flying! We are going to Malcolm Sargent House in Scotland in October, just before her next MRI scan. We have all been invited to watch Disney on Ice this coming weekend, which Summer is really excited about. Friends of ours are doing a Charity Party in Aid of Summer and Alder Hey’s Ronald McDonald House. We would like to thank everyone for their continued support and to post pals for sending Summer’s cards and gifts! She loves it when the postman comes! We have been doing a lot of camping lately with Summer and her brother Phoenix, taking them to various VW Shows around the country. We had a letter through the beginning of last week to say that Summer’s operation to have her central line removed was going to be 2 days later. We were surprised but relieved as we were hoping that it would be taken out before she starts school in September. She was extremely brave as we had to starve her from 7:30 Thursday morning and she didn’t go down to theatre until 4:30 in the afternoon. She was very patient and understandably got bored, but didn’t ask for food once, bless her. We are very proud of her. So the next day we took her shopping and she picked some Cinderella glass slippers from the Disney shop but was more excited about going to McDonalds for lunch! Easily pleased! Can we take this opportunity to thank Post Pals and all the people who send and have sent Summer cards and parcels throughout her treatment. Summer will continue on observation until further treatment is required in the future. Her next MRI Scan is booked for the 22nd October. We are due to go to the Malcolm Sargent House in Scotland in October too, so we are looking forward to that. Julie, Brent, Summer & Phoenix. We have received Summer’s MRI results from last week and we are extremely happy to share the good news that Summer’s cyst and tumour remains stable even after completing chemo in April and she has had no new growth which is such a relief. Summer is staying well and looking really healthy. She has been enjoying attending a few afternoons at the Primary School which she will start in September. She is doing a great job of being big sister, we are so so proud of her. She was really brave when we took her back to hospital after having a three month break and the difference is unbelievable – she is so aware of what is going on and is always asking questions. Thanks to Post Pals for their continued support. Summer loves receiving her cards, they always make her smile. We have our new baby! Phoenix Ethan was born on 7th June at 8am. He weighed 7lb 1½oz. Summer is very excited and is besotted with him. She is such a good helper it’s great. Summer has her next MRI Scan on the 5th July, and then we meet with her Consultant on the 17th July for the results. Summer has been very well since completing chemo and her appetite has come on in leaps and bounds, we are so proud of her. Thank you to everyone who has sent Summer presents and cards, it really does make her smile and she loves waiting for the postman in the mornings. Summer completed her last chemo on 12th April but she required blood transfusions and had to stay in hospital for 5 days afterwards to recover from an infection. The relief of the chemo being completed is strange but wonderful. Summer looks much healthier but is a little confused as to why the hospital visits have stopped. We would like to thank Post Pals for their surprise card announcing Summer had completed chemo we will treasure it forever!! We have had a meeting with Summer’s Oncologist and he has decided for Summer to keep her central line in for a while longer so that if surgery is required in July to remove the cyst growth, it will be easier for her. More decisions will be made at the next MRI Scan on the 5th July, so feeling rather nervous. Summer’s baby brother is due in 4½ weeks so we’re very excited now! We have had a mixed month with good news and bad news. Summer celebrated her 4th birthday which was a very special day for all and she thoroughly enjoyed it. She is now very excited about the Easter Bunny coming. Summer had her ear operation just after her birthday. The brilliant news is that while she was under anaesthetic, they realised she didn’t require any grommets. Whatever was there had resolved itself and the relief was indescribable. We were over the moon! Summer had her MRI Scan last week and we have been informed that while the solid mass tumour is still stable, we have had no more shrinkage. Summer has new Cyst growth very near to the tumour and it is one that could give cause for concern, possibly surgery. We meet with Summer’s Oncologist and team at the end of the month as Summer is completing Chemotherapy next week after nearly two years (another private celebration) and starting observation. She is to have a kidney function test this month to check on her kidneys now that the chemo will be finished and have regular hearing checks too. Obviously, we have mixed feelings of excitement and fear, but we are staying positive. Summer’s next MRI scan is the 5th July so we will wait and see what happens next. Fingers crossed. Summer’s baby brother will be about 3 weeks old, so we will be very busy and occupied which will be good. We would like to thank everyone at Post Pals for sending Summer parcels and cards for her birthday and for all the supporting messages that she has received on her Website. Summer was post pal of the month and it was her birthday too – she received lots of cards and presents, so thank you to everyone who posted to Summer. She was extremely excited and waited for the postman every day! At the moment Summer is very well, she will probably require blood transfusions at the end of the chemo cycle, but then she will be put on the waiting list to have her central line out which will be fantastic. Summer is already telling everyone that when “Wilbur” (central line) goes in the bin, we are going to teach her how to swim! The last couple of weeks have been very distressing and upsetting for Summer as she has not been happy about going to hospital and having her treatment or co-operating with the hearing tests. She has been so brave throughout all her treatment and is now probably fed up of being touched and the constant invasion. She completed her chemo cycle yesterday and her blood levels are all low but because she is border line they are not transfusing just yet. Summer has her ear operation booked for the 16th March just after her 4th Birthday which will inform us of what is in her ear and if they can remove it. Summer also has her MRI Scan this month on the 29th March and double chemo the same day, so a very busy month for her and us. I was in hospital last weekend with a false alarm for an early labour (I’m only 26 weeks pregnant!) I think all the stress is catching up with me, but I have to say Summer was a little super star and has been my little helper all week and is looking after me. We are so proud of her. Thank you to everyone who sent Summer post, she received some great gifts including: – comic relief ears, some cd’s, a hand puppet and more. It really made her smile. Summer is currently in hospital at the moment, she completed her 3 week cycle of chemo on thursday and all her blood levels are low and she needs platelet and hb transfusions. Her temperature also went to 38.6 so they started her on IV drugs for 48 hours. We were hoping to take her on a little holiday tomorrow but hopefully will be able to go on Monday if she is well enough. Summer is going to be a big sister and is very much looking forward to it! We are having a baby boy! Summer had to go into hospital Christmas day tea time but luckily was allowed out 4 hours later with oral antibiotics. Summer received lots of Christmas Cards and was very excited every morning when the postman arrived. Thank You to EVERYONE who sent Summer post in December. Thank you to everyone at Post Pals who sent Summer a Christmas present and to Summer’s Elf; as it really made Summer’s Christmas a special one and despite being poorly she was still happy and Post Pals made that happen. Summer has received a lot of post in November and it made her very happy and excited every morning. She has had a good month, maintained her weight and is still currently having chemotherapy. She will be home this year for Christmas which is fabulous and her next MRI Scan will be 21st Dec 2006. Thank you to everyone who has put a smile on Summer’s face! We would like to thank all the children at a School in Manchester who sent Summer letters and pictures about themselves, that was lovely. Big thanks to Kate, Despina, Nikki, Cheri & Itsy Dog, Kelly, Charlie beautiful pic, Aamilah & Uzayr, Julie Barett and many more. Summer has had her MRI Results from September – her tumour is still stable but no more shrinkage. She will complete Chemotherapy next April. She has another MRI Scan on the 21st December. She had two transfusions last week and has just come back from a holiday at Malcolm Sargent House in Scotland. Summer would like to thank Hwee Hoon for her lovely postcards from Singapore, Tibet & Turkey and her bracelet it was also touchy feely. Also thanks to Julie Barrett for the Halloween card and balloon. Summer had her MRI Scan last week and we are painfully awaiting her results, we will let you know as soon as we can. She is pretty well at the moment; she is having a kidney function test and hearing test this week before starting her 3 week block for chemotherapy. Summer received a touch and feel book which she loves and a handbag that you make yourself. Summer loves receiving mail (her daddy is a postman!) and the postcards from around the world are fantastic, so thanks everyone! Summer has her next important MRI scan on the 27th September. Summer is still in hospital with a high temperature. She has been given a third antibiotic because she is neutropenic (no immune system). Her bloods have just come back and she needs a platelet transfusion and magnesium infusion together with other medicines. Tomorrow they are going to give her a blood transfusion along with the antibiotics and then she will be transferred to Liverpool Hospital for Chemotherapy on Thursday.